On a grand, flamboyant scale, Mozart struggled with the same big questions that await every artist: Where does my creativity come from? Am I loved? Is my art loved? What will happen if I give everything Iâ€™ve got? Mozartâ€™s life holds a lesson for all of us: Thereâ€™s only one way to find out what will happen if you pull out all the stops. Get to know the man behind the music through the eyes of Aloysia Weber, the woman who broke his heart and sang his music. 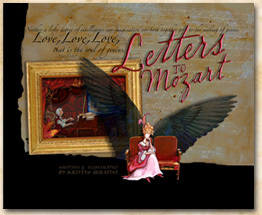 I wrote and illustrated this 142 page book to celebrate Mozart’s 250th birthday.